Finger Strengthening - Get Fast & Strong Fingers! Finger strengthening is important for so many things. You use your fingers and hands everyday, and keeping them strong and healthy is important. There are tons of activities that require strong fingers. If you play the fiddle, piano, or any other instrument, then strong fingers are great for striking keys and improving finger dexterity. If you do martial arts, rock climbing, wrestling, or even swinging a baseball bat or sword, you need strong wrists and fingers. All of these activities become easier, and opening jars at home and doing everyday chores become less difficult too. There shouldn't be a reason NOT to do finger strengthening. Strong fingers depend on the muscles in the hand and forearm. The hand flexors and extensors in your forearm contract and extend your fingers. Also, there are many muscles in the hand that help your fingers move. Your Opponens Pollicis and Adductor Pollicis, which are responsible for your thumb's movement, are the major muscles in your hand. So, it's the muscles in your hand and forearm, and the tendons in your hand that connect those muscles to your fingers, that need to be strengthened. Let's make 'em stronger! If you're practicing for a sport, you can always increase the weight or resistance behind a specific movement to build strength. This will build power and muscle, but you have to watch yourself to make sure you don't pick up any bad habits because of the extra weight. For example, you could run with weights on your ankles to give yourself more resistance. If you do Japanese swordsmanship, you could swing a really heavy wooden sword to work your fingers and grip for that movement. For rock climbing you could climb with weights, so you drop the weights after your workout and find the climbing much easier! You just have to be creative, to tailor each exercise your specific sport. These are the best exercises for finger strengthening. They get you to use your fingers to exert force in directions you aren't used to exerting force towards, as well as adding resistance to the movements. So, here are the regular gym exercises you can use to build your strong fingers. Start slow, and don't hurt yourself! Fingertip push-ups are a great finger strengthening exercise. You don't need any special equipment, just your fingers and the will to get stronger. These are like regular push-ups, but on your fingertips. Position your hands at chest level, slightly wider than your shoulders, and start doing 'em! These work your grip and fingers in new and exciting ways. This is like a regular pull-up, but you have a changing grip. By hanging from a towel, holding on gets much harder as you pull yourself up. Your grip changes slightly, it's a different grip from the one that you normally use, and the towel slips and slides on the bar. These guys are for serious finger training. The idea is simple: push down with your fingers to develop your crushing grip. And be sure to stretch your fingers in the opposite direction from time to time! I like the Gripmasters since they let you work on individual fingers. It's difficult to isolate them normally, but the springs let you improve ALL your fingers individually. 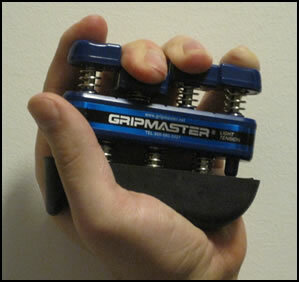 This is better for individual finger strength than a regular V-style gripper, where you work your whole grip. When working your whole grip, you frequently end up strengthening the stronger parts of your hand and neglecting the weaker parts. I haven't seen these anywhere, but they are a great way to work your grip and fingers. The idea is to grip an (irregularly) shaped dumbbell by its large, heavy end and flex your hand around in circles from the wrist while holding it. This is an odd exercise, but it strengthens your forearm through the flexing and irregular movement - and the large end of the dumbbell is great for working your grip, too! These are your exercises for getting strong fingers. Start doing them regularly and you'll find your fingers getting powerful pretty fast, and you’ll see improvements in your other activities. • Click HERE to leave 'How to For Finger Strengthening' & learn more about hand grip exercise!